A couple of weeks ago I took two close contacts, one of which was fellow blogger Tim Garratt, for a private tour around the Bentley Motors factory in Crewe. I have been previously as my brother works there. When I left school I wanted to be a car designer or an architect. Clearly I went for the latter, but have loved cars for all of my life. The Bentley factory is a very special place. Its was built in the 1930’s by Rolls Royce to manufacture the Merlin spitfire engine, they still have one on display in the factory. After the war, Rolls Royce and Bentley motors were made there. In 2002 VW Group had acquired Bentley (while BMW had purchased the Rolls Royce badge). This meant that VW had an amazing team of people who understood Bentley to the core; from the brand and design philosophy, to the exceptionally talented craftsmen and women. Today many of the staff working there have decades of experience, joined by a new generation of staff, who all share a genuine passion for Bentley and ensuring the very best quality in all they do. This is British manufacturing arguably at its best. Today, Bentley produce their flagship Mulsanne, the brand new Flying Spur, and the hugely successful Continental GT and GT Cabriolet. These cars are actually defined and differentiated by the amount of man-hours and detail involved in their production. They are priced accordingly too. What is really clever though is the fusion of modern manufacturing with traditional coach building techniques. As you walk around the factory it is clear to see VW Group’s investment and experience has radically updated and improved the efficiency of building cars. However robots do not dominate, in fact there’s hardly any. People still hand-build these cars, with care and skill. This is one of the unique things that reinforces Bentley’s brand and exclusivity. There are many examples of the lengths that Bentley go to source the very best materials, there was one which stood out for me. For a Mulsanne car they use 17 full bull hides for each model! These Bulls are sourced from specific locations where they are not exposed to either barbed wire or insect bites. Bentley’s attention to detail, from source of materials to finish product, is second to none. 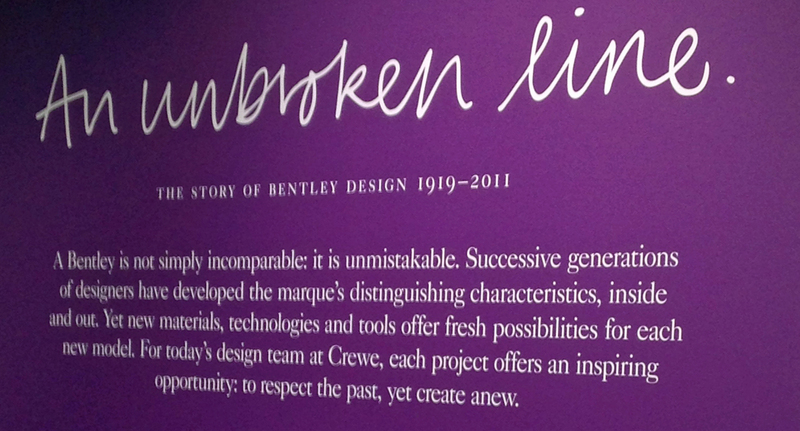 Every Bentley car in the world is designed and manufactured in Crewe. Their largest markets in recent years have been the Middle East and China. Clearly we didn’t go near the design studio, but we were informed about some of their methods. We saw a full scale clay model of a GT. Bentley adopt all sorts of processes to develop the cars design, including the NASA developed 3D printing which we are seeing in Architecture now. 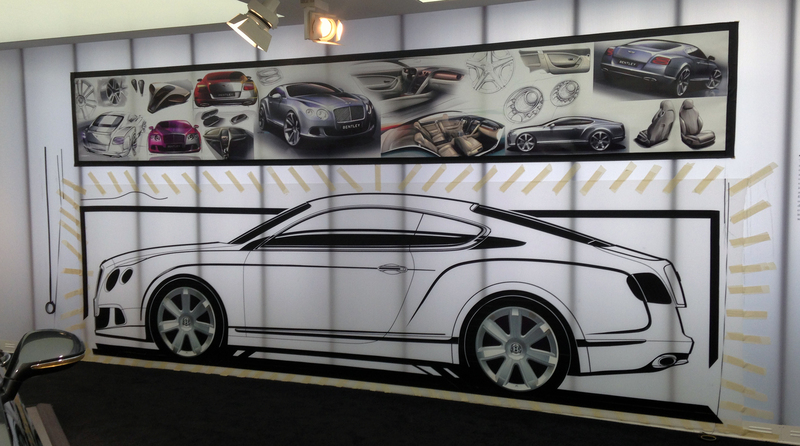 Their cars always start with hand-drawn conceptual sketches. Design should always begin with the pure connection of pen and paper, not constrained or influenced by any kind of technology. During the design evolution, Bentley have a ‘design garden’. This is an external space which is used to review and assess design development models in changing lighting natural conditions, either as the design team and/ or with the senior execs for key sign off stages. What’s next for Bentley? Their uber luxury 4×4 is in development, set to exceed the Range Rover. They also hinted at a potential lightweight fast car – perhaps a competitor to McLaren road cars or of course Ferrari? They will no doubt be extremely careful to avoid becoming too mainstream and diluting their exclusivity, but they have a winning formula at the moment and it would be good to see Bentley evolve further with their luxury heritage. So Bentley have successfully achieved a phenomenal transformation from being perceived to be a ‘poor mans Roller’, to now being a hugely successful independent brand in their own right – and its all made in Britain! It was a fascinating experience and inspirational to see the dedication, passion and commitment of so many people in something they clearly love. Also to gain an insight into modern car design and manufacturing was interesting. I think I’ll be ordering a GT at some point in the future. Question is; what colour when the choice is limitless!